The contract is between you (The Buyer) and That’s Crafty! (The Seller) whose registered office is at Unit 1E Bates Ind. Estate, Church Road, Harold Wood, Romford, Essex RM3 0HU, England. The goods shall be the products supplied by the seller to the buyer according to these terms and conditions. We will take payment from your card at the time you place your order. Taking payment does not mean we have accepted your order and in the event of us not accepting your order, a full refund will be given as soon as reasonably possible (and in any event within 14 days of us advising you that your order has not been accepted). Unless otherwise stated, all prices shown are inclusive of VAT. The prices shown do not include any delivery costs, which will be added to your total order price where applicable. Except where otherwise set out in these Terms of Sale, the price payable by you for the goods is the price given by That’s Crafty! at the time you place your order. All products remain the property of That’s Crafty! until paid for in full. Whilst we try to ensure that all the prices on That’s Crafty! website are accurate, errors may occur. If we discover an error in the price of the goods you have ordered we will inform you as soon as reasonably possible. You will then be given the option of re-confirming your order at the correct price or cancelling your order. That’s Crafty! agrees not to disclose any information or data files supplied with, stored on, or recovered from client’s equipment except to employees or agents That’s Crafty! subject to confidentiality agreements or as required by law. Delivery times are given in good faith and approximate only. Please refer to our delivery page for full details on delivery areas and charges. We cannot be held responsible for any direct or indirect expenses caused due to late delivery. We make every effort to deliver all your items within the specified period set and we will always do everything within our power to keep to a delivery date but there may be circumstances beyond our control that cause delays. We shall contact you to let you know if we are having any problems getting a delivery to you within that time. Late delivery does not constitute a reason for the buyer to cancel the contract. We also reserve the right to deliver the goods in more than one visit when deemed necessary. We advise you to inspect the goods upon delivery. If any damages are discovered after delivery they must be notified to us in writing via email (laura@thatscrafty.co.uk) within 14 days following the delivery time. Any claims submitted after this period will not be accepted. For overseas orders please check our "Overseas Delivery" page for further information. As a retail consumer you may cancel your contract with us in writing at any time up to the end of the fourteenth day from the date you received the goods. All returned goods must be unused and in their original packaging and be in the condition they were when delivered to you. We will deduct monies from refunds where goods show signs of unreasonable use leading to diminished value. The goods are returned at your own cost and risk and must be returned within 14 days of you notifying us of your wish to cancel your order. If you cancel the goods prior to delivery but the goods have already been dispatched, you must accept delivery and return the goods to us in the same manner stated above. If you do not pay the costs of return delivery, we shall be entitled to deduct these costs from the amount of your refund. The goods remain your responsibility until we have accepted your return delivery. Once you have cancelled your order and we have received any relevant returned goods, any payment taken by us will be returned to your original payment method as soon as possible and in any event within 14 days of cancellation. If you chose the option to have the goods delivered by more expensive means than our cheapest standard delivery option offered, you will only be refunded the cost of the standard delivery option. 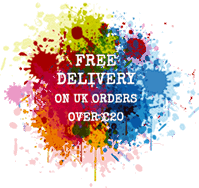 If your original order was over £20 and you qualified for free postage, if you return one or several of the items and your order value then falls below £20, you will be refunded for the item/s less £2.95 postage. We have insufficient stock to fulfil the order or you have ordered items which have been discontinued. A pricing error had occurred on the Web site. If we cancel your order in part or in full, you will be notified by email and we will refund your payment method that was used for the transaction with the full cost of any cancelled items within 14 days of cancellation. We shall not be held liable to pay any additional compensation for any reason. There may be times when we or our suppliers have insufficient stock to complete the order or the items may have been discontinued, in these circumstances we may offer alternative items of equivalent quality and price. Should this be the case, you will be notified in writing prior to your delivery; if we receive no instruction to the contrary this will be taken as acceptance of the changes. We will request that the items be returned to us and in such circumstances you must return goods to us or we may ask for you provide us with photographic evidence of the alleged defect. You continue to use the item and aggravate its condition after giving notice of the fault. You alter or attempt a repair of the product in any way. If we comply with the above condition we shall have no further liability for a breach of any of the warranties in respect of these goods. Once we have agreed the return of a faulty item, you have 30 days from the date of the agreement to return the item to us. We will not accept returns received after 30 days. Any goods replaced and returned to us will become our property. By registering any of your personal details with That’s Crafty! you are agreeing to allow us to contact you regarding any of our products or services. We will not pass on any of your personal details to third parties for marketing purposes. Our entire liability to you under these Terms of Sale shall not exceed the price paid for the goods you have purchased through That’s Crafty!